Alopecia is the partial or complete loss of hair—especially on the scalp—either in patches (alopecia areata), on the entire head (alopecia totalis), or over the entire body (alopecia universalis). A basic understanding of hair biology and normal hair development is essential in distinguishing normal versus abnormal hair loss in children and adolescents. Hair consists of the shaft and the root, which is anchored into a follicle beneath the epidermis. Hair is formed by rapid divisions of cells at the base of the follicle. Except for a few growing cells at the base of the root, hair, which is composed of keratin and other proteins, is dead tissue. An individual hair follicle has a long growth phase, producing steadily growing hair for two to six years. About 80 percent to 90 percent of hair follicles are involved in this active growing period called the anagen phase. Next is a brief transitional phase (of about three weeks' duration)—the catagen phase—during which the hair follicle degenerates. About 5 percent of follicles are involved in the catagen phase. Then a dormant period known as the telogen phase occurs. About 10 percent to 15 percent of hairs are involved in this phase, which lasts for approximately three months. Following the telogen phase, the growth phase begins again, and the growth cycle repeats. Each person has about 100,000 hairs on their scalp. Although it is normal to lose between 25 and 100 hairs per day, any disruption of the hair growth cycle may cause abnormal hair loss. It is estimated that alopecia affects several million children in the United States and that hair loss is responsible for about 3 percent of all pediatric office visits. Alopecia areata affects both sexes and all ages but is most common in children five to 12 years old. About one per 1000 children has alopecia areata. Approximately 5 percent of children with alopecia areata go on to develop alopecia totalis, and some of these children may develop alopecia universalis. Tinea capitis ( ringworm ) affects an estimated 10 percent to 20 percent of susceptible children, and although the demographics are sketchy, telogen effluvium is the most common type of alopecia in both children and adults. A fungal infection called tinea capitis, which is similar to athlete's foot, is a common cause of hair loss, particularly among toddlers and early school-aged children. Tinea capitis, which affects the hair root, is a highly contagious condition and is often transmitted when a child uses the comb, brush, hat, or bed linen of an infected child. Tinea capitis seldom occurs after puberty . Children with this condition usually have patchy hair loss with some broken hairs visible just above the surface of the scalp. The patches of hair loss are usually round or oval but are sometimes irregular in shape. When broken off at the surface, the hairs resemble small black dots on the scalp. Occasionally gray flakes or scales are present. Alopecia areata, or localized baldness, is the sudden appearance of sharply defined circular or oval patches of hair loss, most often on the scalp. These patches are smooth and without inflammation, scaling, or broken hairs and may appear overnight or over the course of a few days. This condition may affect scalp hair, the eyebrows, eyelashes, genital area, and occasionally the underarms. The hair loss is not accompanied by other visible evidence of scalp disease, and the condition is not contagious. In alopecia areata, immune system cells (white blood cells) attack the rapidly growing cells in the hair follicles that produce hair. The affected hair follicles decrease in size and hair production slows drastically. Because the stem cells that continually supply the follicles with new cells do not appear to be affected, the follicle retains the potential to regrow hair. Although it is uncertain why the hair follicles undergo these changes, it is thought that a combination of genes may predispose some children and adults to the disease. In those who are genetically predisposed, some type of trigger—perhaps a virus or something in the child's environment—brings on the attack against the hair follicles. Trauma to the hair shaft is another common cause of hair loss in children. Often the trauma is caused by traction resulting from, for example, tight braids, ponytails, or by friction (hats, hair bands, or rubbing against a bed). Trauma may also be caused by chemicals or burns . Another important cause of hair trauma is called trichotillomania—a habit similar to thumb-sucking or nail-biting—of twirling or pulling out the hair. Trichotillomania is generally considered to be a nervous habit and may include the pulling of eyebrows and eyelashes. The hair loss associated with trichotillomania is patchy and is characterized by broken hairs of varying length. Within the patches, hair loss is not complete. If the hair trauma is not severe or chronic enough to cause scarring, the child's hair usually regrows when the trauma ceases. Telogen effluvium, another common cause of hair loss, affects both children and adults. This condition is responsible for more hair loss than any other cause except adult male-pattern baldness. In telogen effluvium, there is a physiologic basis to the hair loss; something happens to interrupt the hair's normal growth cycle and to drive many or all of the hairs into the telogen phase. Between six and 16 weeks later, partial or complete baldness occurs. In the telogen phase, a child's hair undergoes growth spurts and pauses. During the rest phase between spurts, the bulb at the end of the hair root decreases in volume and the hair loosens. Although exaggerated during adolescence , particularly in girls (due the influence of female hormones), even preadolescents may experience excessive hair loss on a daily basis. 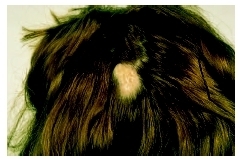 The scalp hair, however, appears normal in this condition. It is important to consult a dermatologist or pediatrician if a child sheds hair in large amounts (more than 100 hairs per day for longer than four weeks) after combing, brushing, or shampooing or if the hair becomes significantly thinner. Also, if a child's scalp show signs of infection (redness, swelling, tenderness, warmth), consulting a physician is advised. Bald spot on the scalp from the effects of alopecia. If children are observed pulling out their hair, eyelashes, or eyebrows, parents should consult a physician in order to determine the underlying cause of the habit. Because hair loss is caused by a variety of conditions, a physician diagnoses the cause of the child's hair loss based on medical history, family history of hair loss, medications (including vitamins ), nutritional status, hair-care habits, and a physical examination. If the physician suspects a fungal infection of the scalp, a hair sample may be tested by microscopic examination in the laboratory. Microscopic examination of a hair plucked at the periphery of the hair loss area often reveals a characteristic disruption of the integrity of the hair shaft. The infection may be confirmed by culturing the scalp for fungal organisms. Blood tests or a scalp biopsy may be required if a medical condition—such as lupus erythematosus, thyroid dysfunction, iron deficiency, or hormonal imbalance—is suspected. Treatment varies with the cause of the hair loss. In some cases, early treatment is important in restoring the hair. Often congenital and hereditary hair loss and hair shaft abnormalities, however, have no effective treatment. For fungal infections such as tinea capitis, treatment usually requires a systemic approach with an oral anti-fungal prescription medication such as griseofulvin (Fulvicin). This medication, which must be taken for four to eight weeks, is very effective in curing the infection and restoring the hair. Early treatment is important in preventing possible permanent hair loss. Topical creams or antifungal shampoos containing 2 percent ketoconazole are often used two to three times per week for eight weeks. Although shampoos and topical antifungal creams may decrease scaling, the infection usually returns because these products do not penetrate the hair follicle deeply enough to eradicate the infection. A wide variety of treatments are available for alopecia areata. There has been some success with use of medications that suppress the immune system, including dinitrochlorobenzene (DNCB) and diphenylcycloprope-none (DPCP). The side effects of these drugs, however, may outweigh the benefits for a disease that most often resolves on its own. In addition, topical creams or lotions such as minoxidil, cortisone (also injected into the scalp), or anthralin are sometimes used. Because such treatment triggers hair growth in bald patches but does not eradicate the disease, however, new bald patches can occur in other parts of the scalp even if new growth occurs. Hair loss resulting from telogen effluvium or drug side effects usually requires no treatment. Hair loss from poor nutrition or medical illness usually stops with the adoption of a healthy diet and treatment of the underlying medical condition. Once the stressful event is over, complete hair growth usually occurs within six months. There is some evidence to suggest that aromatherapy is a safe and effective treatment for alopecia areata. Aromatherapy involves rubbing scented essential oils into the skin to treat localized and systemic disease. Massaging the essential oils of rosemary, lavender, sage, thyme, and cedar into the scalp is believed to increase circulation and reduce stress. About three to six drops of essential oil are added to 1 tablespoon of jojoba or grape seed oil and massaged into the scalp. In addition to aromatherapy, stress reduction techniques such as yoga , meditation, or creative visualization may increase blood flow to the scalp and stimulate hair growth. The prognosis for children with alopecia varies with the cause of hair loss. Certain types of alopecia respond more readily to treatment. For example, hair loss in telogen effluvium usually occurs over several weeks to months, then stops. Hair then grows back over the next several months. Overall, the outlook for children with alopecia areata is good. Alopecia areata usually resolves with time, although alopecia totalis is less likely to remit. With appropriate treatment, from 60 percent to 95 percent of children regrow all of their hair within one year. Early treatment and the proper antifungal medications can cure tinea capitis, although patience is required because the condition may take several months to resolve. Although it may not be possible to prevent all types of alopecia—such as alopecia areata or hair loss associated with medical conditions—certain forms of hair loss may be prevented. Highly contagious fungal infections such as tinea capitis, for example, may be prevented by keeping hair clean and by teaching children not to share hats, combs, or hair brushes. In addition, adolescent girls should be cautioned not to share makeup. It is important to teach children and adolescents to handle their hair with care, especially when shampooing, drying, brushing, combing, braiding, and using chemical processes. Hair is more fragile when it is wet, so vigorous towel drying and rough combing and brushing should be avoided. Wide-toothed combs and brushes with smooth tips are recommended. Children may experience hair loss or excessive thinning as a result of certain nutritional deficiencies. To prevent such hair loss, it is essential to include B-6, biotin, and folic acid—either in the diet or in supplement form. Bulb —The hair bulb is the expanded portion on the lower end of the hair root. Epidermis —The outermost layer of the human skin. Keratin —A tough, nonwater-soluble protein found in the nails, hair, and the outermost layer of skin. Human hair is made up largely of keratin. Shaft —The portion of the hair that extends from the follicle and goes beyond the surface of the epidermis. It has been found that certain minerals , including magnesium, sulfur, silica, and zinc are also important for maintaining healthy hair. Beta-carotene, which is converted to vitamin A in the body, is also essential to healthy skin, hair, and nails. Beta-carotene is found in green and yellow vegetables and fruits. Because hair is composed of protein, a diet that is too low in protein may cause hair thinning or a disruption of the growth cycle. Thus eating a protein-rich diet often results in improved hair growth. In addition to lean meat, good food sources of protein include fish, eggs, dairy products, and beans. Because society has placed so much emphasis on appearance, hair loss, particularly if it is severe, may be emotionally devastating to children and adolescents. Hair loss can lead to embarrassment, low self-esteem , and depression. Thus it is important for parents to consult a physician as soon as possible to minimize not only the physical but also the emotional impact of hair loss on their child. See also Dermatitis ; Malnutrition ; Trichotillomania . "Disorders of Hair." In Nelson Textbook of Pediatrics , 17th ed. Edited by Richard E. Behrman, Robert M. Kliegman, and Hal B. Jenson. Philadelphia: Saunders, 2004. Powell, Jennifer, Natalie Stone, and Rodney P. R. Dawber. An Atlas of Hair and Scalp Diseases. Carnforth, UK: Parthenon, 2000. Usatine, Richard P. "Bald Spots on a Young Girl." Journal of Family Practice 53, no. 1 (January 2004): 33–36. American Academy of Dermatology. PO Box 4014, Schaumburg, IL 60168–0050. Web site: http://www.aad.org. American Hair Loss Council. 125 Seventh Street, Suite 625, Pittsburgh, PA 15222. Web site: http://www.ahlc.org. National Alopecia Areata Foundation. PO Box 150760, San Rafael, CA 94915–0760. Web site: http://www.naaf.org . Brodell, Robert T., and Giorgio Vescera. "Black Dot Tinea Capitis." Postgraduate Medicine Online 111, no. 4 (April 2002). Available online at http://www.postgraduatemedicine.com/issues/2002/04_02/pd_brodell.htm (accessed October 10, 2004).